Second son of Ernest Reginald and Emma Elizabath Collett.of 15 Dover Street and previously 23 Hawthorn Road. Collett had been educated at the Chippenham Secondary School and the worked as a clerk in the GWR booking office. He volunteered for flying duties and started training in August 1940 and qualified in July 1941. He spent about 1 year on operational duties with Costal Command. Crashed in sea on navex near Holy Island, Northumberland. Approached Low Newton from the sea. It then turned north towards Beadnell beach, passing low over Links House, crashing just south of Long Nanny burn. As it careered over the dunes and sand it cut a pathway through the rough ground, totally breaking up in the process. Possibly flew too close and struck friendly ships. 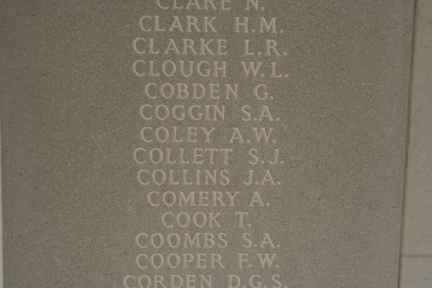 WR Chorley "Bomber Command Losses".